Asian traditional therapies have been in use for centuries and cover areas that encompass the entire body such as massage therapy and acupuncture. Herbal medicines are used to balance the body with natural products such as noni, a tree that grows throughout Southeast Asia and produces an oval fruit. Traditional medicine in China is linked to yin, which is associated with cold, darkness, and earth, and its opposite yang, associated with warmth, light, and heaven. Qi is another element of Chinese medicine that represents the balance between yin and yang. Because the Chinese regard the body as a miniature form of the universe, balance is sought through their traditional medicine. An imbalance between yin and yang is believed to be the cause of illness. Herbal medicines are important to regulate the body's balance in TCM and are prescribed according to the condition of the patient. Herbal medicines are also used as a dietary supplement to prevent and treat certain conditions. Herbal medicines may be powders, pills, raw herbs, or tinctures to be used on the outer body or internally. Herbs and plants, such as noni, are used to improve the outer body, including the hair and skin. Acupuncture, a large component of TCM, has been in use for thousands of years in Asia. The practice of acupuncture makes use of small, thin needles that are inserted into the body's energy channels to stimulate the mind's and body's energy. It is used to relieve pain, digestive problems, depression, and many other conditions. The herb, mugwort, is sometimes used in connection with acupuncture. Acupressure involves massaging special points on the body believed to regulate the yin and yang and is used to restore the body's energy to its proper levels. Some studies have shown that acupressure may be helpful in certain conditions such as for the treatment of vomiting and nausea, following surgery and chemotherapy and during a spinal for surgery. However, it might be a good idea to ask your physician before an acupressure session, since some conditions are contraindicated. Tai chi is a good, low-impact exercise. While tai chi is also a martial art, it has developed into a form of graceful exercise combined with mental focus, relaxation, and breathing. Because one move flows gracefully into the next, your body stays in motion. This low impact exercise, according to the National Institutes of Health, can improve stability and balance in older people, and can improve the lives of those who suffer from debilitating diseases such as Parkinson's, heart disease, and cancer. 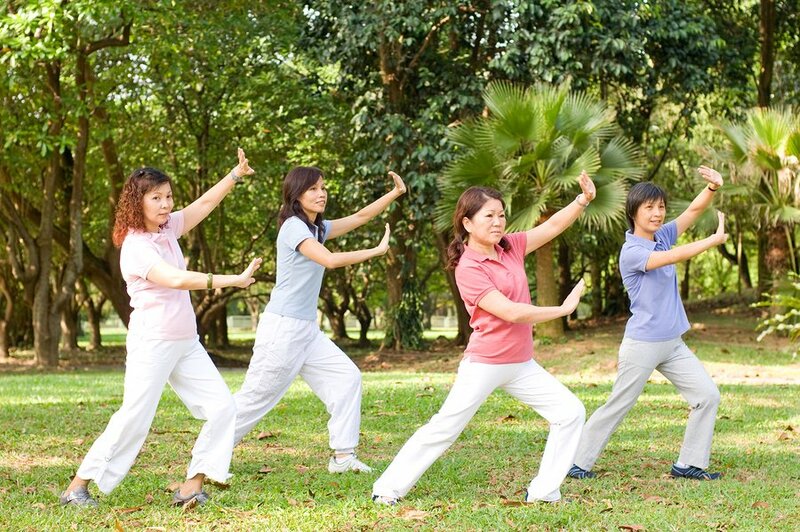 Of course, anyone with a health condition should consult with his or her physician before beginning tai chi. Ayurveda is a holistic system developed in India that has been in use for thousands of years and aims toward a balance between the body, spirit, and mind. Those who practice ayurveda believe that each individual is made up of the elements of space, water, fire, earth, and air. Each person may be one of three combination types, called doshas. Practitioners of ayurveda believe that an imbalance can be caused by an individual's age, emotions, an injury, or seasonal and climatic changes. The vata dosha (the air) is believed to control the basic functions of the body. The health of this type of individual can be adversely affected by grief, fear, staying up too late, not spacing out meals correctly, or eating dried fruit. Pitta dosha, composed of water and fire elements, is believed to control the function of the entire body. Individuals of this type can be adversely affected by staying out in the sun too long, eating sour or spicy foods, and getting fatigued. Kapha dosha represents water and earth types. The body of this type of person can be disrupted by overeating, drinking or eating things that contain too much water or salt, overeating sweets, being greedy, or sleeping during the day. Natural medicines are commonly used in Asia. Many have become popular in other countries due to their effectiveness. Biconi products use elements of traditional Asian products, such as noni and virgin coconut oil, to restore your skin and hair to a healthy condition. Shop women's products or shop men's products to find healthy hair products.